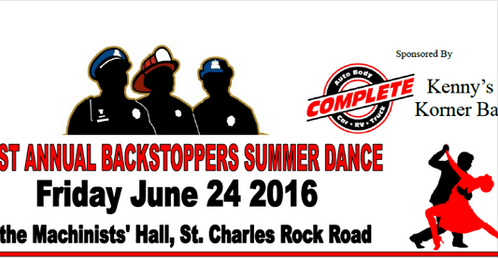 By supporting the 1st Annual BackStoppers Summer Dance here in our community you can express your appreciation in a tangible way for the lives given on behalf of others. Presentation 7:30 p.m. to 7:45 p.m.
Dance Featuring The Galaxies Band 8:00 p.m. to 11:00 p.m. This includes beer & setups. BYOB and Snacks for your table. Take chances on 50/50 Drawing, Silent Auction, Shot Gun Raffle & Attendance Prizes! Meet Car 54 & Red the Fire Truck!